The Martha Josey Hiphugger barrel saddle by Circle Y is available in a regular or wide tree, and antique or regular oil. The Hiphugger is also offered in a round or square skirt. This saddle bears the prestigious endorsement of multiple World Champion barrel racer Martha Josey. Among a long list of accomplishments in her barrel racing career, Mrs. Josey has qualified for the National Finals Rodeo (NFR) in barrel racing for four consecutive decades. (Yes, you read that correctly: Decades.) For more information about Martha Josey and her Hiphugger barrel saddle please scroll down beneath the saddles for sale. Below: The Martha Josey Circle Y Hiphugger barrel saddle from Horse Saddle Shop. Choose from a round or square skirt and regular or wide tree. Available in seat sizes from 13″ to 17″. 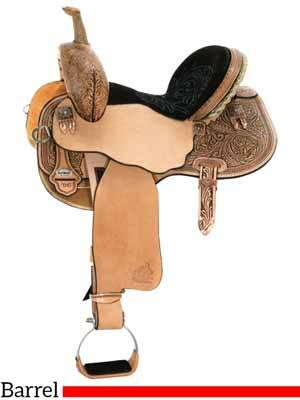 The Circle Y Martha Josey Hiphugger barrel saddles below are for sale from HorseSaddleShop. In the list of saddles below please note this saddle may be offered in a round or square skirt. World champion barrel racer Martha Josey is a multiple world champion, an inductee into the Cowgirl Hall of Fame, and qualified for the National Finals Rodeo (NFR) in barrel racing for four consecutive decades. That’s decades, not years. In 1964 Josey and her great gelding, Cebe Reed, won 7 horse trailers and 52 barrel races in a row. Josey went to the National Finals Rodeo on Cebe in 1968 and 1969. A few years later Martha and another great gelding, Sonny Bit O’Both, qualified for the NFR for four straight years, from 1978 to 1981. In 1980 Sonny earned the distinction of being the only horse in history to win the American Quarter Horse Association (AQHA) and Women’s Professional Rodeo Association (WPRA) World championship titles in the same year.